Writing, films, travel, family, friends, yoga, cafes, fun, books and music. That's what life is all about. Whoever designed the a Dendy Cinema's location knew what they were doing. Placing an art house cinema next door to a cafe, a book shop and a record shop is sublime. All human needs can be satiated within 50 feet of each other. But, of course the temptations don't end there. There's King St with its plethora of quirky, funky shops, cafes and restaurants, bars and pubs. Really, when you think of it, why would anyone ever want to go home? Newtown is one of those eclectic suburbs that feels as though it has everything: cafes, restaurants, bookshops, markets, street fairs, yoga centres and the list continues. The vibe is friendly, all are welcome: locals, families, backpackers, students, dogs, children, artists, buskers, it is a place where people love to meander and explore. The Dendy cinema specialises in art house films, shunning the usual Hollywood templates. It satisfies viewers who don't need their films all neat and tidy, who prefer to think independently and who relish a film challenge. It has regular Reel Mums sessions plus frequent Q&A sessions and festivals. Next door to the Dendy, the bookshop, Better Read than Dead aptly matches the atmosphere of the cinema and its cosmopolitan surroundings. 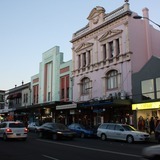 The store has become a Newtown literary landmark, similar to Gleebooks and Glebe. It is renowned for its wide focus for obtaining quality books quickly while at the same time nourishing the neighbourhood's artistic feel with regular author events. In today's digital times, who would've thought a record shop would flourish let alone survive? Well, Fish Records has succeeded and has become another King St landmark after opening in 1991. Specialising in classical, jazz, opera, show tunes and nostalgia as well as local and independent music, it also has the same authentic feeling as the Dendy and Better Read than Dead. And finally, on a practical aside, after enjoying all the fun of King St., there's a Franklins shop just a few doors down from the Dendy so essential shopping can be done before trotting home. What a night. What a town. Why? Because what more do you need from a street? Cost: It depends on what you buy and do. I totally and breathlessly agree with you about the great city convenience that is Dendy Newtown. I have on a few occasions stocked up on my groceries at good ol' Franklins next door after sating my movie lover's heart with the latest art house offering.